In the wilds of Africa and Madagascar, lovebirds live in flocks and are very social. The size of the flock varies with each species. Within the flock individual lovebirds will often pair up and be mates for life, staying very close to each other and constantly grooming each other. They display very loving affection, hence the term "lovebirds". 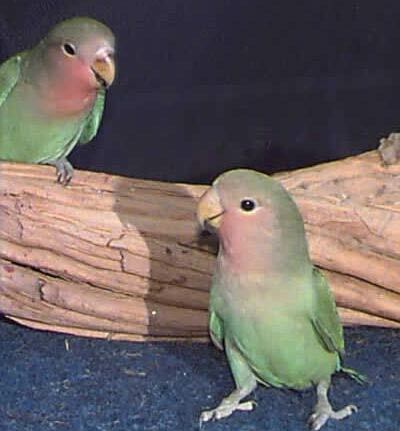 Lovebirds are lively flyers and climbers, and as pets they are enjoyed for these antics as much as they are enjoyed for their beauty and their affectionate displays to their mate.The most popular and readily available species are the Peach-faced Lovebird, the Fishcher's Lovebird, and the Masked Lovebird. Popular Lovebirds and Color Mutations!